How to Post on Instagram from a Computer - Instagram Hack! 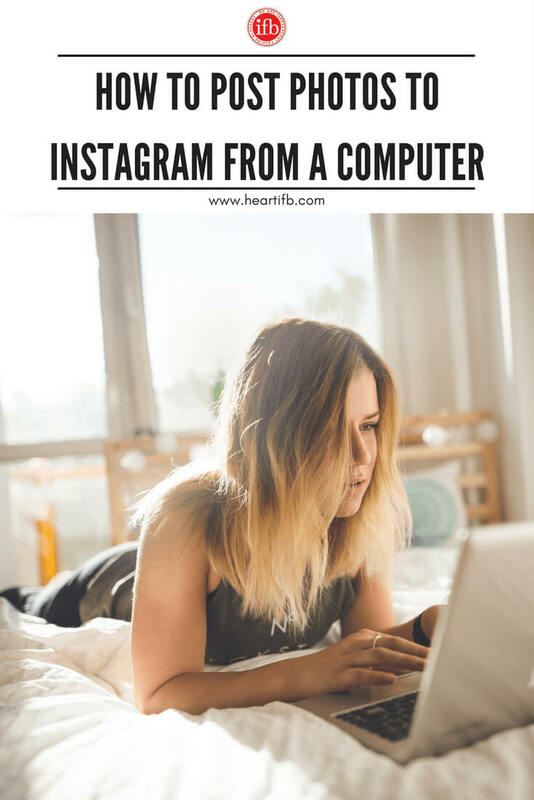 Want to know how to post on Instagram from a computer? Without the help of a paid service, third party app or software? Spoiler alert: you will need to have Chrome installed on your computer, in order for this hack to work. Instagram was created as a mobile app and is meant to be utilized on a smartphone. It allows users to upload spontaneous, “in the moment” images directly from their mobile devices. 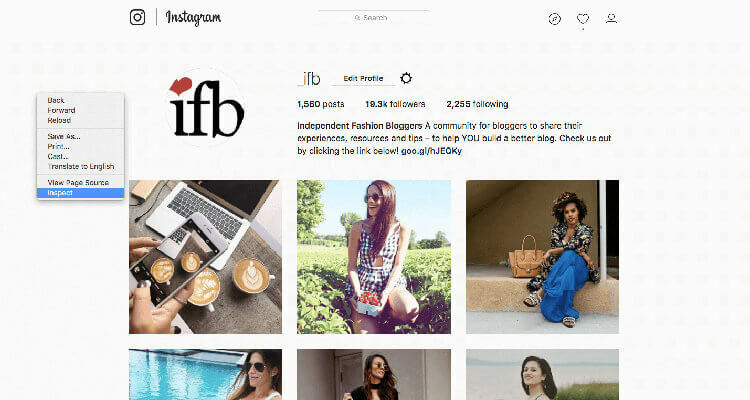 IFB has recently discovered a way for Insta-fanatics to post directly to the app from the comforts of their desktops. In this article, we're excited to show you how to post on Instagram from a computer. Nowadays most influencers prefer to shoot their content on a DSLR camera and edit their images with Adobe Lightroom or Photoshop, before uploading them to Instagram. Many professional bloggers find it easier to type up captions with the help of a “real” keyboard. Often, many people store content on their computers and prefer to directly upload it to their accounts – as opposed to having to transfer it from their computers to their smartphones, before posting on Instagram. While there are a variety of Instagram scheduling apps on the market, they only tend to get you halfway there. Planoly, Later, Hootsuite and Buffer are excellent tools when it comes to planning out a social media strategy; but they don’t bypass the need to use a smartphone in order to post the content. They’re great “reminder” tools, but aren’t able to post on behalf of an Instagram user. Check out this FREE Instagram hack IFB recently discovered. It's a good options for individuals looking for ways to directly post to Instagram from a computer – and it doesn't involve any third party services or software. This is by far the easiest way, when it comes posting on Instagram from a computer, that does not involve downloading an extra app onto your smartphone. A recent update to Instagram’s website has just enabled a feature which users of iPads and desktop PCs everywhere have been waiting for. 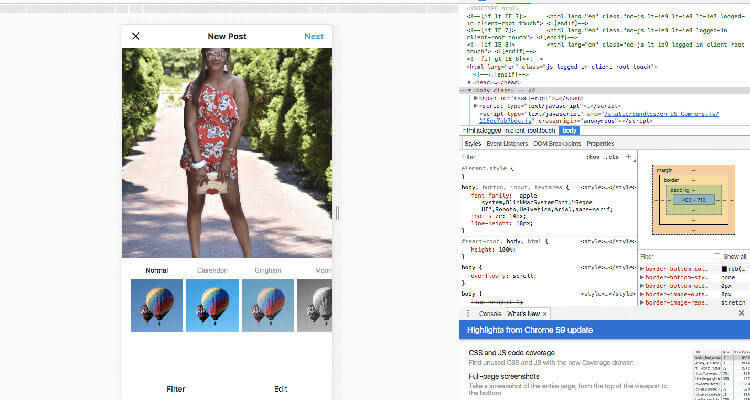 You can now upload images directly from a computer to your Instagram account, with a few simple clicks in Chrome. 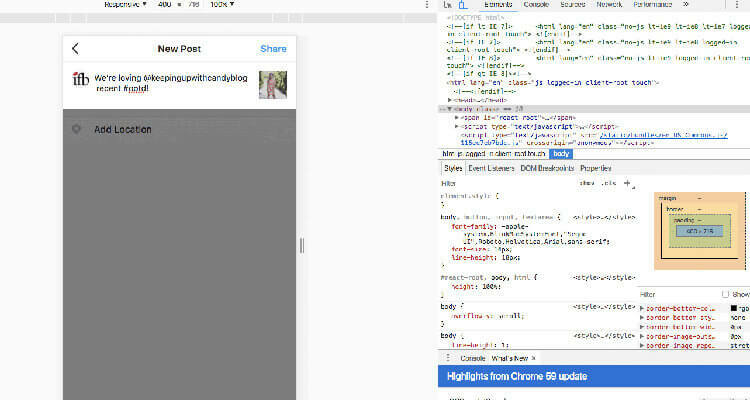 Open Chrome and log into your Instagram account. Right click on the page and scroll down to the “Inspect” option. This will allow you to bring up Chrome's developer mode. If you don't have Chrome, consider downloading it to give the below a shot. Next, click the little mobile icon in the top upper left corner of the developer bar. In the image below, the icon is light blue. Ignore all the code. You will notice, on the left hand side of the page, Instagram will appear to look very similar to it's mobile interface. Next, click on the camera icon in Instagram (as you would if you were uploading a photo from your smartphone) and select an image you would like upload. As you can see below, you will be able to to choose a filter and edit the photo, according to your tastes…. … along with adding a caption. When you're ready, hit “Share”. Then, get excited about knowing how to post photos to Instagram from a computer for free and without the help of any third party apps. 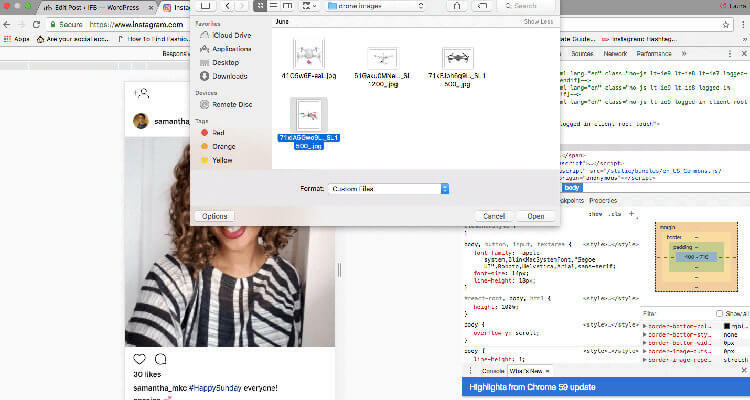 For individuals looking to conveniently upload still image content from their computers to Instagram – without the hassle of having to transfer their photos to a smartphone – knowing this hack is a win. It's free, doesn't involved any third party apps or software, and is relatively easy to execute. 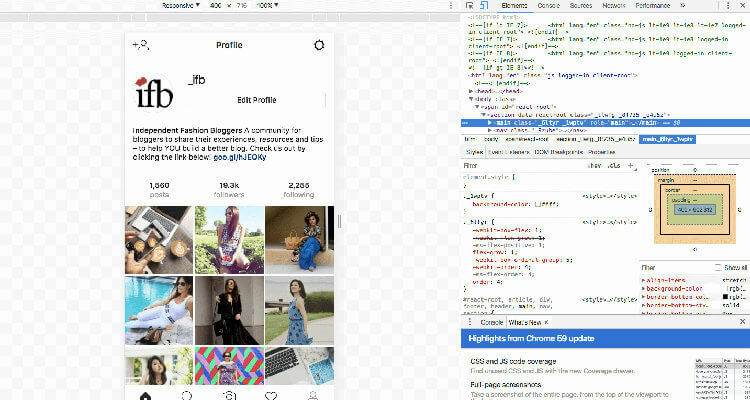 However, there are a few “con's” to using Chrome's developer model in order to access and post photos to Instagram directly from your computer. Firstly, this method tends to be a bit “glitchy.” You might need to attempt uploading your images more than once before succeeding. It took IFB about two attempts on average to upload our images directly from our laptop. Secondly, if you're wanting to upload content to your Instagram Story or send a DM from your computer, it isn't possible to do so with this hack. While you are able to follow and unfollow other Instagram users, you won't be able to snag any Boomerang footage. Other sources have noted that adding filters when using this hack hasn't been possible; however, IFB had no issues selecting and adding in a filter, along with editing the images. What we weren't able to do with this method is adjust the brightness, saturation, contrast, etc. of the images we wanted to upload. Finally, IFB is not entirely clear if Instagram is aware of this hack. We also don't know whether they intend to find a way to fix it any time soon. So make the most of it while you can! This hack is handy for individuals looking to quickly post an image or two from their desktops to their Instagram feeds. It's not a very advanced method of uploading content to Instagram. We can't necessary recommend to professionals; but this hack could be useful to many bloggers or individuals, looking for easy ways to manage their Instagram content. Do You Know Any Quick and Easy Instagram Hacks? *It's important to note that Instagram strongly encourages its users to upload images from their mobile devices. It’s not uncommon for an account to be flagged or closed when uploading from other sources. So use this hack at your own discretion. Me too Jason, I want & need the features you mention, but never would have realized what this program does if you hadn’t listed it all here. Work Instagram from my laptop? Yes! So, thanks for untangling their sales pitch and showing some awesome features. It’s just what I need right now. You recommended Instamate so I signed up. So far I have found it impossible to use. I run my own website so am reasonably tech savvy. I find it extremely complicated and they keep asking me to upgrade and pay more. I asked for a refund however apparently it is beyond the 14 days and the affiliate commission has been paid. I am very dissatisfied with this product. I’m really sorry you’re having issues. The first thing I mentioned in the review is that the sales page is very salesy, and had us skeptical. They definitely use some upsell techniques which can be annoying… Sorry about that. I’m not sure what version you bought, but ours came with several explanation videos showing how to use the tool. Did you see those? We were able to get the program to work without any issues. Can you be more specific with why you’re finding it impossible to use? Have you contacted their support about learning to use the program? I purchased the same package “Luxury Edition” but now i don’t now where to log in. I haven’t received any e-mail yet? Are you suppose to get the log in information via email? I was looking for desktop client for instagram and now I have found one! Has this been tried by anyone else? I’m keen to use it, but honestly can’t wade through the invasive videos and banners! the links to the program do not work. Jason (or others) – Do you know if Instamate has an auto-scheduling feature? I’m looking for the ability to set a posting schedule & then upload photos to automatically post based on my pre-defined schedule. Instamate allows you to schedule your post date and time months in advance, so you can plan your posting schedule and not have to worry about content for a while. Not sure if this is exactly what you’re looking for, but I hope this answer clarifies the tool’s offering. Interesting! I did not know that there is software for the PC, I’ll try it! I’ m glad I came across this blog, I have not heard of Instamate before, I will surely check it. i couldn’t get to the program from the links in first paragraph. it takes me to the jvzoo affiliate marketing network platform. We’re looking into this and hopefully will sort it out/update the links soon. Sorry for the inconvenience! Thanks for the trick, I always searching for a way like that.